"These original series artifacts were screen worn by Commodore Decker and Captain Tracey in the episodes titled "The Doomsday Machine" 1967 and "The Omega Glory" 1968. This set of rank insignias are very rare costume accessories, as they were custom made for filming and only worn in these two episodes making these a must have for any collector of original series costumes and props. Both came directly from the Bill Thiess estate when his collection was sold at Butterfields & Butterfields. These pieces are presented in a custom display case measuring 16" wide x 13" tall x 9" deep." A very rare and collectible prop, but at this price and in this economy, I don't see these selling quickly. While this is the 91st week of auctions, It is titled Week 101 to be consistent with the Star Trek Auctions Archive. There were only 77 items this past week, but some very strong costumes. There were also lots of great bargains as well. Total sales were $ 34,111 and the average item was $ 455. 12 items topped $ 1,000. The Phase II Engineering Red Starfleet Uniform was the hot item this week and topped the chart at $ 3,701. The reason I think this went high, is that bidders realized those were a pair of pants, not from the series, but from one of the Pilots! James Cawley, of Star Trek New Voyages, and a very experienced collector, gave me the insight that the length and color were a give away. The Mork & Mindy emblem on the back is interesting and adds to the history of the costume. This was a very strong price, but we haven't seen many of these as they all sold at Christie's. The Voyager Captain Janeway two-piece Uniform was a good deal at $3,101. As I pointed out though, the description was weak. IAW said the jumpsuit has a tag but not the jacket. Well, was the uniform found in the Janeway section? Were they together? Another example of sloppy recording of what is crucial information leads to shakey provenance. It probably was all together, but we should know for sure. The DS9 Breen Costume Lot at $ 2,425 sadly had no helmet. Still these are awesome costumes and a helmet replica can be fabricated. I won the first of these to be auctioned and it is a beauty. The amount of effort that goes into making these is quite impressive. This costume also was missing the belt and holster and so those will have to be replicated as well. I won the Lt. Ducane 29th Century Starfleet Uniform from "Relativity" costume, but have decided to sell it to my good buddy Josef from Austria, who worked so hard as photographer and layout designer on teh Battlestar Galactica auction catalog. This one is a beauty. I was hoping that I would be able to get all three colors, red, green abd Captain Braxton's blue, but I am told that the Braxton has been sold already. At $2,126 this went a bit higher than the previous ones, but those were all red versions and this is the first green version. Captain Archer's Desert Uniform went to my good buddy Dana and was an absolute steal at $ 1,600! Certainly deal of the week. It had rank pips and boots and is a beuaty! One other great costume worth mentioning is the Captain AG Robinson Starfleet Uniform from "First Flight". I won this one at $986 which was an awesome deal, and this would have been deal of teh week if the Archer hadn't gone so cheap! I am really excited about this one as I have a bunch of props from this episode and loved Keith Carradine in this role. The Captain Picard Circuitry Bay PADD at $1,213 was top prop this week. It was a light up version and thus a very good deal. The USS Warp Core LCARS Panel went for a reasonable $1,002. I say reasonable because LCARS panels have held their value over the past two years. They seem to be the signature piece of TNG and later TV series and thus have sustained a strong demand. Best Buy of the week: The Captain Archer's Desert Uniform at $ 1,600. Worst Buy of the week: None! Keep up the good work! Sleeper of the Week: The Captain AG Robinson Starfleet Uniform from "First Flight" at $986. Star Trek: Voyager Captain Janeway two-piece Uniform was a good deal at $3,101. Star Trek: The DS9 Breen Costume Lot at $ 2,425. 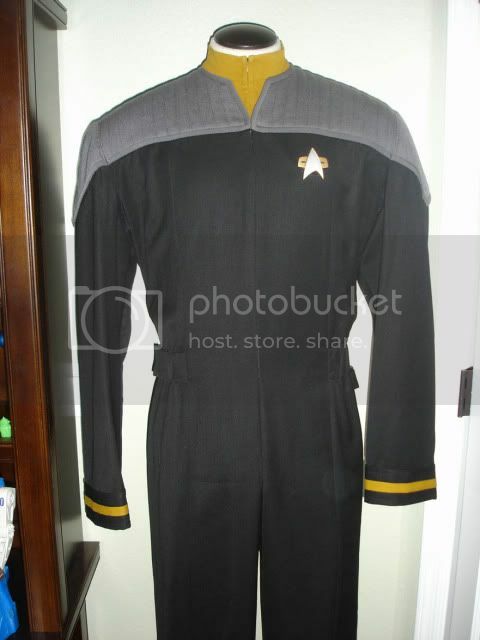 Star Trek: The Lt. Ducane 29th Century Starfleet Uniform from "Relativity" at $ 2,126. Star Trek: The Captain Archer's Desert Uniform at $ 1,600. While Profiles in History has had entire catalogs devoted to Star Trek in the past, this auction, they have only one prop and one costume, but both are awesome. Note that this will be the last Profiles in History auction through eBay Live as eBay Live goes away at the end of the year. 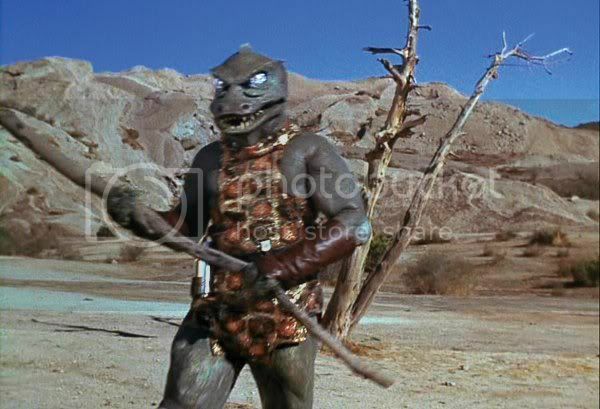 The truly amazing Star Trek piece is the Gorn costume from TOS. Yeah, this is the one! It is in beautiful shape and just about as good a Star Trek Alien costume as you could get. (I don't think the Mugato costume survived!). The costume comes with the tunic and the gauntlets the Gorn wore. The Gorn costume itself, complete with big head, sold previously at Profiles. The estimate is $ 10-12,000, but this should go no less than $ 15,000. This is truly a great piece of Star Trek history. The Picard Phaser Rifle is a nice piece with excellent provenance. It comes from John Dwyer, long time Star Trek crewman, who worked on the original series as well as many of the movies. I inspected the rifle and it has a few small missing pieces. The sight on top is missing the rear plastic targeting piece and the side panel which exposes the interior wiring for the working lights is gone. Both pieces could easily be duplicated by Brett Jones at Federation Surplus as he has one of these rifles. The front light appeared to be missing, but it may just have been pushed in. This rifle is a hero as it has the front vacu-formed removable piece to allow access to the batteries and lighting. Reasonable at the $ 4,000-6,000 estimate. Check out all Profiles items on eBay or on their web site. Data costume from "Insurrection" for sale by Forum member. Andy Klein from the Star Trek Prop, Costume & Auction Forum has a Data costume for sale and I offered to put it up on my blog. Contact Andy at andy@3rdchair.com. From Andy: A Beautiful uniform used in the movie Star Trek: Insurrection by Brent Spiner as Lt. Commander Data. This is the costume that was used in the underwater scene in which Data walks into the lake with a Tricorder to investigate the source of emissions causing problems on the planet. Uniform is in fantastic condition and comes with costumers tag and Certificate of Authenticity from It’s a Wrap auctions. A costume featured in Star Trek IX: Insurrection for wear by “Data” as performed by Brent Spiner. The costume is a black Starfleet uniform jumpsuit with gray quilted shoulders, sewn on ‘away team' gear loops at the waist, and operations gold division strips sewn onto the cuffs with an operations gold long sleeve undershirt. The undershirt features a sewn on tag inscribed ‘Data, Brent Spiner, Wet Suit’ while the jumpsuit features a sewn in tag reading ‘Data, H20, work stunts, dry suit’. Price is $1900 firm. This is exactly what I paid for the costume and I will provide free priority shipping to the buyer. The costume does NOT include the replica communication badge shown attached. Please email me with any questions or requests for more pictures at andy@3rdchair.com. Two of my good friends in the collecting community have taken to blogging themselves for the purpose of showcasing their collections. Both Francis and Jim's sites are great examples of how to share your love for your favorite Star Trek costumes. I urge you to check them both out. Ferengi Costumes. Francis was a hoot to have at Vegas this year. He even wore his costumes and got in a full Ferengi costume. He is also a major womanizer, so I think he fits the Ferengi role well. Francis is our resident Ferengi expert on the Star Trek Prop Forum. His blog uses the same tool (Blogger) I do, and Francis does a great job of filling in details on the costumes with screencaps. I urge you all to check out both their sites! Widely held Vulcan philosophy and beliefs require Vulcans to attain a state of mental order and tranquility. It is a lifelong goal of most Vulcans to reach this state. To do so, they use the techniques of T'san s'at (ST: VOY "Alter Ego). T'san s'at is the intellectual deconstruction of emotions and the effects of emotions on one's actions. The process of T'san s'at can involve years of meditation, study and struggle. In attaining a goal, it is often helpful to have a physical symbol to remind one of the journey they are on. As in most cultures, Vulcan religion and philosophy have many important symbols with diverse histories and meanings. No single symbol means the same thing to every Vulcan. However, there is a series of three symbols which appear with great consistency and across many different professional boundaries in Vulcan society. These are called Rata, Tafar and Tapan. Usually, these symbols are worn on the chest in a vertical column. Their meanings, translated into English, are Concept (Rata), Discipline (Tafar) and Process (Tapan). According to some, a poetic form may be associated to the unity of these symbols: "Branches entwined form the tree" (http://startrekpropcollector.com/trekauctions/items/4184). This would suggest that on their own, these symbols are but pieces of a larger whole and thus incomplete unless presented together. The concept of unity in Vulcan symbology is not unique to this Trinity. It can also be found in the Kol-Ut-Shan or IDIC (ST: VOY "Gravity"). IDIC is an acronym which stands for Infinite Diversity in Infinite Combinations. The symbol which represents IDIC consists of an organic sphere which is pierced by a triangular shape. At the intersection of the two shapes there is a beautiful gem. This suggests that when two or more diverse objects, ideals or persons come together something unique and beautiful can be created. The IDIC symbol was used as early as the 4th century CE when it appeared on Surak's katric ark (ST: ENT "The Forge"). In that incarnation, the triangular portion was directly vertical where most later examples of the symbol have the triangular portion at an angle. To some, this has suggested a secondary meaning of the symbol as representative of Mount Seleya piercing the Vulcan sun. However, as the IDIC symbol is most often found on objects or as decoration on walls it has little bearing on our discussion of symbols and clothing. The IDIC has also taken the form of a medal and has sometimes been used as an award of merit. 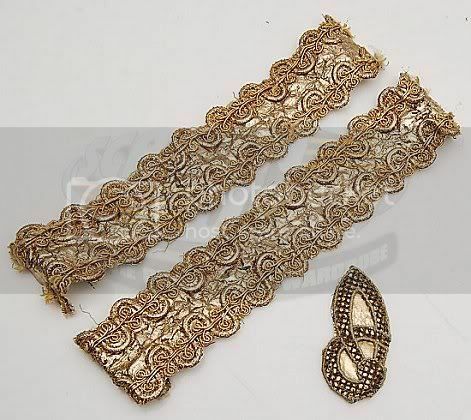 In these cases it is worn on the body but it has never been seen worked into the original design of clothing. Let us return to the Trinity of Rata, Tafar and Tapan. These symbols were in use as part of Vulcan clothing as early as April 5, 2063 when the Vulcan ship T'plana-Hath landed on Earth and Vulcans made "first contact" with Humans (ST: First Contact). In these examples from 2063, the symbols are rendered in what has come to be called Vulcan calligraphy. All the later examples below are rendered in Vulcan print script. The symbols were in heavy use on clothing from 2151 through 2161 (ST: ENT "Broken Bow" through "These are the Voyages"). A careful examination of the images from 2063 and 2151 will reveal that it is not only the Trinity which remained in fashion during that time. The clothing worn by the commanding officer of the T'plana-Hath is nearly identical to that worn by the Vulcan to the far right in the 2151 image. In 2272, Spock wore the Trinity as part of his robe when he re-joined the crew of the Starfleet vessel Enterprise (ST: The Motion Picture). After his death in 2285, Spock was buried in this same robe (ST: The Search for Spock). Heretofore, the individuals whom we have seen wearing these symbols have mostly been politicians: world leaders, government officials and ambassadors. A notable exception is a Dr. Strom who was seen wearing the Trinity in 2152 (ST: ENT "Stigma"). It should be noted, however, that though Strom was a medical doctor he was working for the government. At this time in his life, Spock was not a political man. However, we know that in the 2270s, Spock was attempting to attain Kolinahr. More than simply a suppression of emotions as in the T'san s'at, Kolinahr represents an actual purging of emotions; the attaining of a state where one no longer feels at all. Though Spock did not attain Kolinahr it seems likely that the concept was still important to him. We can speculate that wearing the Trinity was a reminder to him of what he hoped to attain. 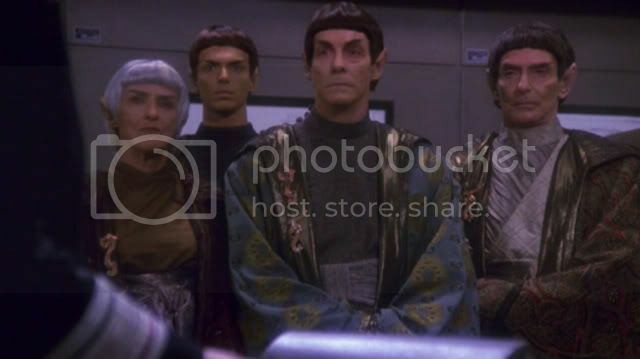 When we next see the Trinity being worn it is in 2369 by Ambassador Lojal on his visit to space station Deep Space Nine (ST: DS9 "The Forsaken"). 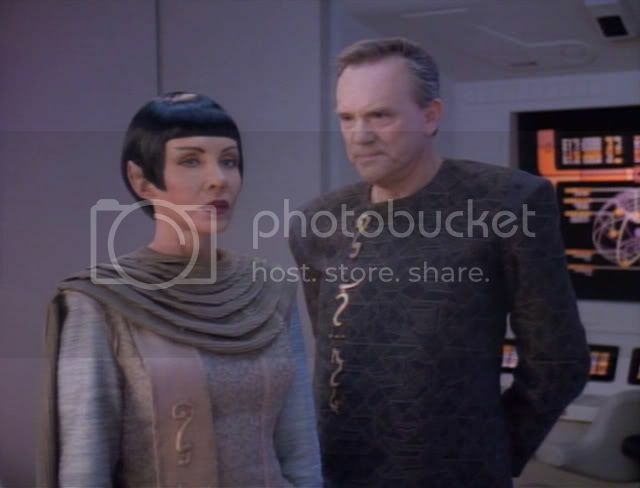 Also in 2369, we can see the Trinity being worn by Dr. T'Pan and her husband Dr. Christopher when they visited the Starfleet vessel USS Enterprise-D (ST: TNG "Suspicions"). Clearly, by 2369 the Trinity is being worn by persons in all segments of society. Indeed, it may be possible that this was always the case and we simply have not recorded it. Regardless, it can be said with some certainty that these three symbols are important elements of Vulcan culture. Anything that is important enough to wear upon one's person must have great personal or cultural significance. That significance need not necessarily be the same for every individual. In every culture there are religious and philosophical symbols which are worn by many individuals; both lay persons and officials. To each person, they likely mean something slightly different but equally important. This essay is to be followed by a second part which will focus more specifically on Vulcan religious symbols as they are integrated into clothing with specific emphasis on the religion surrounding Mount Seleya. Very little of this essay can be considered accurate to Star Trek's "canon." The symbols I have referred to as the Trinity have never been discussed on-screen. My information regarding them comes from continuity photos as discussed in auction listings written by the folks at It's A Wrap! Since the information on these continuity photos was written by the actual Star Trek wardrobe department I have taken it as gospel but nothing that has not been discussed on screen is written in stone. Any errors are mine alone. Special thanks to everyone at The Star Trek Auction Listings Archive. Please feel free to contact me at ScottLukasWilliams@Hotmail.com with any questions or comments. 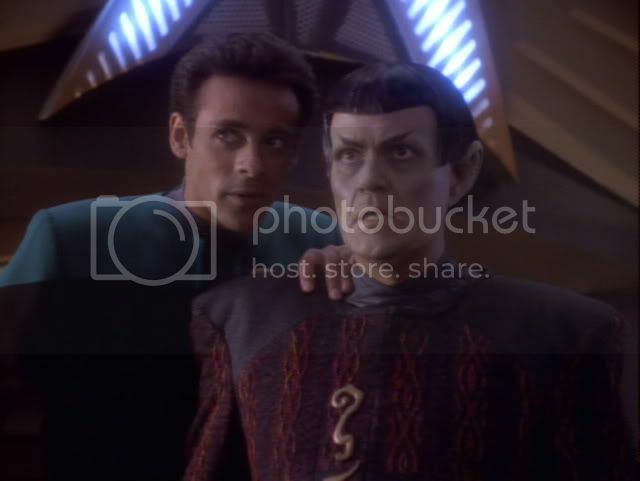 Ambassador Lojal's costume from ST: DS9 "The Forsaken" was sold in an IAW auction on eBay as lot #2204. 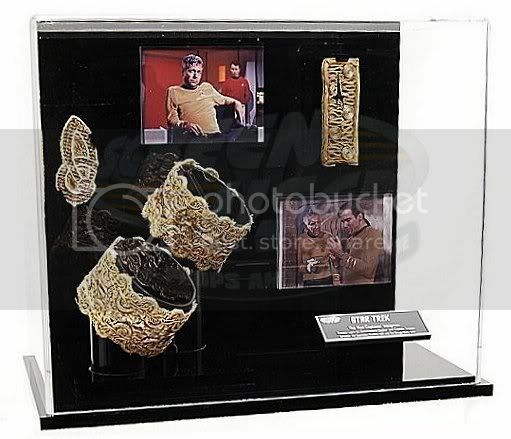 Dr. Strom's costume from ST: ENT "Stigma" was sold in an IAW auction on eBay as lot #4184. 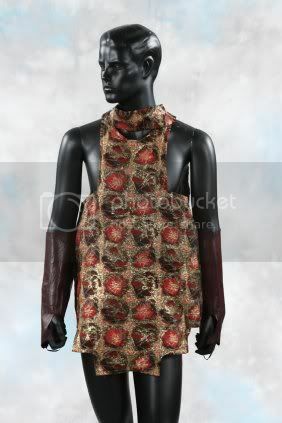 Dr. Christopher's costume from ST: TNG "Suspicions" was sold in an IAW auction on eBay as part of lot #5820. A Tafar pin as worn on ST: ENT was sold in an IAW auction on eBay as lot # 8600. 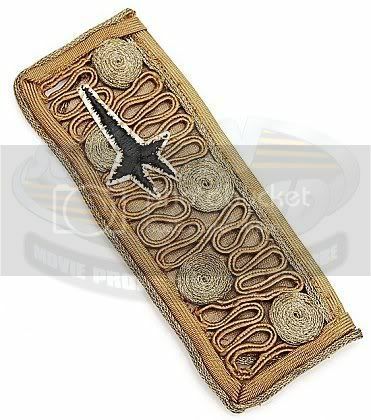 A Tapan pin as worn on ST: ENT is being sold in an IAW auction on eBay as lot #9558. If you search on IAW this week, and order by highest price, you see 7 fantastic costumes. IAW has been jumping between low end props and costumes for weeks, and this is a good week for costumes. There are 7 good ones resting at the top of the heap with six days to go. Everyone is talking about the Phase II Engineering Red Starfleet Uniform. This is an awesome piece with way more Star Trek history than anyone realizes. Bidding is already at $ 1,500 and I see this over $ 4,000. You've got to love the Mork & Mindy emblem on the back, which shows how costumes were treated back in the day. You also start to realize how under priced these items were ar Christie's. Maybe it was because they were some of the last items and there was buyer fatigue on day 3. Still, some people got a deal back then! The TNG First Season Starfleet Uniform Jumpsuit is going strong at $ 1,225. Just a background piece, this one has been surprising. Of course command red is always a fave and always commands a premium over operations gold or sciences blue. This one will go well over $ 2,000. The Voyager Captain Janeway two-piece Uniform is another example of bad descriptions by IAW. They say the jumpsuit has a tag but not the jacket. Well, was the uniform found in the Janeway section? Were they together? Sloppy recording of what is crucial information means questionable provenance. Now, I DO think this was probably all together, but we should know. My guess is this is NOT Colin's description but one of his minions. Colin is pretty accurate and careful. But this description is just woefully unacceptable. At $ 1,125 with 6 days to go, I see this around $ 3-4,000 and well worth it. Captain Archer's Desert Uniform is pretty cool and has rank pips. Again, no mention of tags or how we know it is Archer's outside of the Pips. Well documented boots. I like this and think they look good on display. Also, costumes like this are cheaper ways to get a Captain. I see this around $ 2,500. The Lt. Ducane 29th Century Starfleet Uniform from "Relativity" is a beauty. I have a red one, and this green one is the first we have seen of this color. A LOT of interest in this baby, and it is currently at $ 1,001. Previous ones have gone around $ 1,800 and a secondary market sale last week for a female version was at that price. Expect this to go near $ 2,500. The Captain AG Robinson Starfleet Uniform from "First Flight" is a nice one, despite being ripped up in back. A memorable episode, this costume was worn by veteran actor Keith Carradine. Finally, you have got to love Sybok! Well, Star Trek V sucked, let's face it. But Sybok was a great character and this costume is a great one. It comes with the outer robe. The last one went to the greatest Star Trek V collector in the world, Aaron Carlson for about $ 2,500, but that one was more complete and had boots. Still, this one should go in the $ 1,500-2,000 range. Well, that is a bit of a preview of what is up this week. I don't do previews much, but this stuff deserved a good look as there is so much interest this week. While this is the 90th week of auctions, It is titled Week 100 to be consistent with the Star Trek Auctions Archive. There were no Week 99 auctions according to Burt'[s system, so this was the 100th week of auctions! A big anniversary, that will shortly be surpassed by TWO YEARS OF IAW AUCTIONS. There were 100 items this week but only TWO topped $ 1,000. IAW had a VERY low total sales volume this week, and averaged only $ 214 per item!! That shows how bottom heavy the auctions are. There really was not much outstanding stuff this week, but plenty of bargains. What was amazing is the drop in price from $ 1,025 for the second highest item, the Romulan Disruptor Rifle, to only $ 415 for the third highest item! No wonder the sales numbers were so low!! The Captain Kirk Class D Uniform Jumpsuit was the best Kirk uniform we have seen so far. We have seen Star Trek III/IV civilian wear, and a nice Kirk Commando, A ratty Class A and plenty of Climbing outfits. The only other very nice one we have seen was a Class B we saw in 2007. Some people questioned this costume's lineage due to IAW's lax description. But after discussions with Colin, it was clear this one was the real deal as it is the same size as the one I won from Christie's. William Shatner is 5'9 1/2" according to IMDB and Stephen Collins is 6'1" and this costume was definitely the smaller size. (They both wore one of these in the movie). At $ 6,888 it is a good deal. If this were to come up at Profiles in History, it would go well over $ 10,000. It may not have a costume tag of Shatner's name in it, but it is the real deal. Kira's Baseball Hat from "Starship Down" was a rarity and pretty cool. A steal at $ 310. I mean, how often do we see a baseball hate from Star Trek? The rest were boots and costume pieces and nothing of note. The Romulan Disruptor RIfle at $ 1,025 was the other item this week to top $ 1,000. And this is worth it. I have one just like it and it is a beautiful piece made of solid resin. it is well painted and heavy! The Screen Used Jem Hadar Facial Appliances were an interesting buy at $ 415. These were nicely painted and seemed in good condition. They do show an inside look of Star Trek, and I am warming to the idea of buying some of these to round out my displays. There was a cheap Nausicaan Knife at $ 260 that was a good deal, since the Nausicaans are guys you love to hate (I mean they stabbed Picard in the back for god's sake!). Deals were all over the place. Doctor Phlox's medical supplies were around $ 50-100 each; there were lots of cheap weapons and plenty of uniform parts. It really was a week of odds and ends. Best Costume of the Week: The Motion Picture Captain Kirk Class D Uniform Jumpsuit at $ 6,888 was clearly the best costume of the week! Best Prop of the Week: The Romulan Disruptor RIfle at $ 1,025 was the best prop in a weak selection! Best Buy of the week: The Orion PADD from Borderland at $ 187. Sleeper of the Week: They all put me to sleep! Sorry, too much cheap stuff this week. Star Trek: The Jem Hadar Facial Appliances at $ 415. Star Trek: Enterprise Starfleet Uniform Boots at $ 405. Star Trek: Enterprise NX-01 Corridor Guage Panel at $ 399. While this is the 89th week of auctions, It is titled Week 98 to be consistent with the Star Trek Auctions Archive. There were 87 items this week but only four topped $ 1,000. IAW had a low total sales volume this week, at $ 23,513, due to the vast majority of items being below $ 500. It was another great week for bargains as the product mix continued to be bottom heavy. At $ 2,425, the Chief O'Brien costume was the weeks top costume. These always look good, as the gold is really set off by the black costume. This was the early, Voyager style, so I feel this went high. Also at $ 2,425 was the Q as Borg /Crosis from "Descent" costume. A nice costume, this went higher than previous TNG style Borg costumes, most likely due to the Q connection. I like these better than the foam and latex movie style ones. And I am sure this will display well on a mannequin. The Two Piece Geordi LaForge Uniform with Rank went for a reaosnable $ 2,071. The rank sets this apart, as we don't often see these with it, and Geordi is a popular character, so I think this buyer did well. The Klingon Kronos 1 Phaser Blast Victom Lot went to bidder "bigstartrekcollector". Unfortunately with only 20 items to his name over two years, I am not sure how big he is! None the less, this is an interesting lot from the pivotal scene in Star Trek VI. At $ 988 a fair price. IAW should note that the Klingon homeworld is spelled Qo'noS, not Kronos, which is the phonetic pronunciation. A First Contact Command red Uniform went for a very reasonable $ 910 to longtime bidder jeddi007. Finally an interesting lot was the Prototype Starfleet Uniform Undershirt Lot. At $ 613, forum member Chris did very well for a unique piece of Star Trek history. These undershirts had straight turtlenecks, not the quilted ones we are used to seeing. I am not sure if the fact that an Art Asylum Enterprise Phaser was the top prop this week shows how bad the market is, or that we have some new unenlightened bidders. But the Enterprise Phase Pistol and Holster at $ 1,200 was a bit much. Even the holster is a mess! But, to each his own! This will not be getting top prop awards this week. The Lighted Hand Scanner Prop at $ 692 was a fair deal for a prop that actually lights up. These always are in demand as there is something cool about a prop that works! Ho hum, more Genesis Microorganisms. At $ 565 though, less than $ 100 each. Spread them around as party favors. The MACO Hand Scanner - Static was a great deal at only $ 338. I almost bid on this and would have been a very happy camper at this price. But it wound up going to forum member Jamie, who is a happy collector indeed! Finally, I loved the Star Trek Teapot and think it was a STEAL at $ 270. I was surprised more people didn't go after this. A very cool piece that is even practical. Best Costume of the Week: The Q as Borg /Crosis from "Descent" costume at $ 2,425 was the nicest is a lame week of costumes! Best Prop of the Week: One of the worst weeks ever for props, so the MACO Hand Scanner - Static at only $ 338 wins the award this week! Best Buy of the week: The Star Trek Teapot was a STEAL at $ 270. 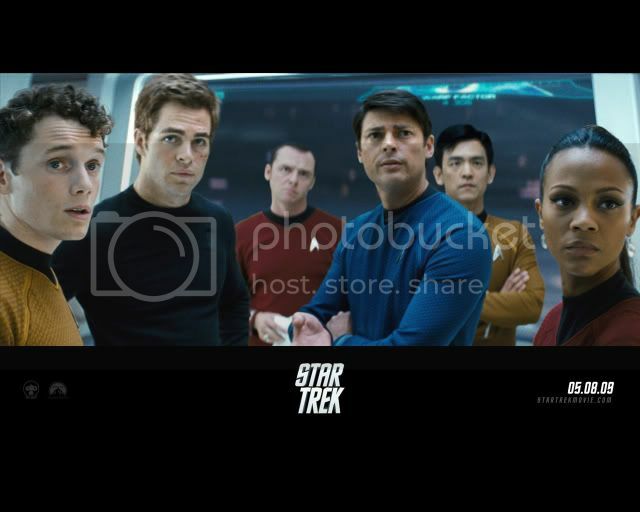 Go HERE to watch the new Star Trek movie trailer. All I can say is AWESOME. This is exactly what our beloved, yet tired franchise needs. Lots of action, fresh new faces, a great vision. This is Star Trek for the 21st century. While this is the 88th week of auctions, It is titled Week 97 to be consistent with the Star Trek Auctions Archive. Well, orange County is having some bad fire issues! The smoke around Disneyland was unlike anything I had ever seen. You actually had to close the vents in your car! Sadly, many people have lost their homes. Which is another great reason to insure your collections if they are valuable. You never know what might happen. There were 109 items this week but only two topped $ 1,000. Another great week for bargains. At $ 1,713, the Spock headband from Star Trek IV: The Voyage Home was a pretty good deal. At Christies, this sold for $ 4,560 with buyer's premium. Pretty iconic and something that is easy to display. A Starfleet Red Two Piece Command Uniform went for a very fair $ 1,136. These continue to be popular and don't dip below the $ 1,000 mark. The fact that this has really become an iconic costume, used by Picard and Frakes for so long in TNG, means people want this version more than any others. At $ 838, the Beige Class B Starfleet Uniform from Star Trek: The Motion Picture was a good deal on what I think is the best version of these costumes. I am sorry I missed this one! The First Contact Style Sciences Blue Uniform was a steal at $ 788. The market is saturated and these are going cheap. If you ever think you might want one, now is the time! Note that Enterprise Jumpsuits are going CHEAP!!! We had a Female Operations Gold go for $ 510, and a Female Operations Red go for $ 449. The Starship Bridge Communication Earpiece was top prop this week at $918. Again, this is an iconic prop, and went higher than I figured, but not higher than it is worth for sure. Another good deal I think. The Nemesis Style Starfleet Phaser Rifle was a great deal at $ 780. The description mentioned an intentional break, but the item had some siugnificant black tape over the left side of the gun and this wasn't explained. Still, a good deal for sure, as anything can be repaired, and at this price, the buyer has themoney to spend on the repairs. The Enterprise Klingon Distruptor from "Bounty" was a great deal at $ 736. These are really nice and the rubber is VERY solid, so this piece will last a long time. Thanks to Colin and his crew for noting that this was the last one available. Notes like that really help collectors. Still, this went CHEAP! I think Hoshi Sato's Bulletin Board went cheap! It is actually a cool prop and includes samples of different languages and even some PADD translights. At $ 637, a good deal! Star Trek: IV Spock headband from Star Trek IV: The Voyage Home at $ 1,713 was the best costume item this week. Best Prop of the Week: Clearly the Starship Bridge Communication Earpiece at $ 918 was the best prop this week! Best Buy of the week: SOOOOO Many great buys this week! I will have to go with the Enterprise Klingon Distruptor from "Bounty" which, at $736, is a total steal for a great piece of Klingon History..
Sleeper of the Week: The Enterprise Uniforms were insanely cheap, but at $ 838, the Beige Class B Starfleet Uniform from Star Trek: TMP was awesome. Star Trek: First Contact Starfleet Red Two Piece Command Uniform at $ 1,136. Star Trek: Generations Starship Bridge Communication Earpiece at $918. Star Trek: TMP Beige Class B Starfleet Uniform at $ 838. Star Trek: First Contact Sciences Blue Uniform at $ 788. While this is the 87th week of auctions, It is titled Week 96 to be consistent with the Star Trek Auctions Archive. Sorry for the delay in getting these posts up, but the last few weeks in Vancouver working on the Battlestar Galactica auctions, were MURDER. We loaded 5 tractor/trailers with stuff and then unloaded it three days later in L.A. at our new warehouse. Then I took a much needed vacation, where I actually got to go spend time at my home! So, I will try and make up for it with a post every day for a week! Week 96 was a week of 10 day auctions. IAW Started the auctions on October 10th, and ended them on October 20th. There were 85 items this week and there were 7 items that topped $ 1,000. The Major Kira Nerys Bajoran Militia Uniform went for a healthy $ 3,100. A great costume, I think these look great on display and I can't fault teh buyer for paying this price for it. Worf's Klingon Boots from "All Good Things..." went for a very healthy $ 2,020! Now I can't agrue with that price, as Klingon boots are rare and these are Worf's! The Unfinished Enterprise Away Team Jacket went for a strong $ 1,646. It was a nice piece, and I am not sure what exactly about it was unfinished. But it looks good and will display well. A new bidder won the DS9 Commander Command Red Starfleet Uniform for a healthy $ 1,425. It came with Lt. Commander rank pips, but the description said it was in the Michael Dorn section. I think this was a bit deceptive (though not intentional on IAW's part). This costume is listed as a Size 40, and everyone knows Dorn is a big guy, so this could not possibly be his. The Vulcan Ceremonial Headpiece was a big surprise, going for a high $ 1,323. Donna, the winner and Forum member, isn;t afraid to bid strong on things she really wants. And this is from Star Trek III, which makes it over 25 years old. I thought the Geordi LaForge Stunt Uniform was a great deal at $ 810. Not a Levar Burton, but still used for Geordi. You have to love anything worn by DeForest Kelly as Dr. McCoy. The Dr. McCoy Starfleet Undershirt wasn't a great piece in and of itself, but the fact that it is McCoy's makes it cool. The Props: The Nemesis Hero Phaser Rifle was a nice one that we saw at Vegas in 2007. It had all the hero attributes, but had a broken scope and was missing some metal panels. At $ 2,382 a good value, which, with about $ 500 worth of work, will be a good piece. I almost went after it, having bought a resin, non-hero previously, but when they are hanging on your wall, they all look the same! Still a good deal. The Hirogen Console went for a strong $ 1,881 to IAW's top buyer Martin from Germany. This is a nice piece that was reused for the Hirogen's in Voyager after being used on Deep Space Nine. Martin loves his set pieces! Originally this was a Cardassian Replicator, and was pretty cool in that configuration. I am a little sad that it was converted, but that is exactly how Hollywood works! The Romulan Mine/Xindi Super Weapon was a cool piece as well. At $ 948 a good deal on a prop whose history you can read here. At $ 761, the Romulan Valdore Panel lot was a very good deal, each panel coming in under $ 200! I think this is typical of the good deals that are happening now with IAW. There is a lot of buyer fatique and so good lots are not getting bid on. The First Contact Enterprise E Bridge Chair went for a cheap $ 709. A really great price I think. The Full Alien Latex Head was a good deal at $ 440 and went to IAW veteran bidder Jason Stevens, who has an office full of these things. Best Costume of the Week: The Major Kira Nerys Bajoran Militia Uniform at $ 3,100 was a beauty. Best Buy of the week: The Geordi LaForge Stunt Uniform was a great deal at $ 810. Sleeper of the Week: The Romulan Valdore Panel lot was a great deal at $ 761, as that means each panel cost $ 190! A steal! Star Trek: DS9 Major Kira Nerys Bajoran Militia Uniform at $ 3,100. Star Trek: TNG Worf's Klingon Boots from "All Good Things..." at $ 2,020. Star Trek: Voyager Hirogen Console at $ 1,881. Star Trek: Enterprise Unfinished Enterprise Away Team Jacket at $ 1,646.